I often write here “We have a choice. We always have a choice.” Today’s message is about free will. While our Guidance, the Universe, our God is available 24/7, it is up to us to listen, hear, feel and trust what is given to us. That in fact was yesterday’s message. 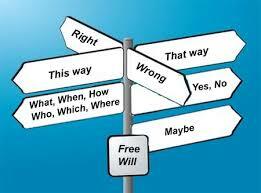 Our free will allows us to accept or reject the information we are given. There are consequences to everything we do or don’t do. My mom used to say, “Payback is a b–ch.” It sounds like a cliche but in fact it is true. Karma is the effect from cause. It brings back to us the consequences of our actions, words, thoughts, feelings. We attract back to us what we are putting out. Today we are reminded to use our free will wisely. -Celebrate your free will and use it wisely for the highest good of self and all. -Wahoo, progress on my sore knee. -A great new cookie recipe perfected.